Sometimes you want just a bit of chocolate, not too much of it; these cookies, which combine chocolate chips with candied orange and grapefruit peels, offer just that. They are very easy to make and can be frozen, and they have a sophisticated look and flavour, so they are ideal to make ahead and keep on hand for holiday entertaining or for unexpected visitors. In a food processor, grind together the almond flour, sugar, egg whites, candied orange peel, and candied grapefruit peel until the mixture is very smooth. Add the chocolate chips and process just until fully combined. Wrap the dough in plastic wrap and refrigerate until it is chilled through, about 1 hour. Pour the sliced almonds into a bowl. With your hands, roll the dough into quarter-size balls. 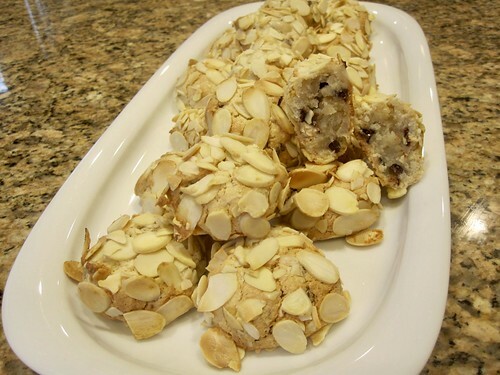 Roll the balls in the almonds until they are completely coated, and place them on the baking sheet. Bake for 12 to 15 minutes, or until the cookies turn a light golden brown color. Remove the cookies from the oven, let them cool completely on the baking sheet, then store them in an airtight container in a cool, dry place for up to 2 weeks, or freeze them, wrapped in plastic and in an airtight container, for up to 1 month.